Whether you're using up the last of your vacation time or traveling for the holidays, countless people are taking to the roads for the ultimate road trip. Before you leave, don't forget to pack these essential items for your trip. Your car should always carry an emergency first-aid kit, but this is an especially important item for your road trip. You never know when your child will fall and scrape their knee or when you'll need a bandage after an impromptu hike in the mountains. You should also include a few extra doses of any prescription drugs you need, including allergy medications or insulin. 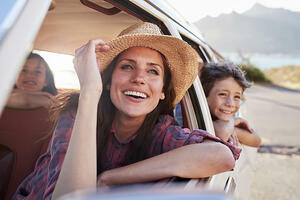 Wherever your road trip takes you, a first-aid kit should be at the top of your list. Should your car break down, it's essential that you stay warm. In the chilly months of winter, a large blanket should be a staple in your trunk. This can work to keep your temperature up until help arrives. But falling asleep on the road is another serious risk when you're on a road trip. It's always better to pull over to the side of the road when you feel tired. If you're unable to find a motel, you can always sleep in your car as well. A blanket is an essential tool for getting through a cold night. Most vans and RVs are equipped with RV water hoses, but this tool is great for cars too. Safe drinking water wells and spigots deliver fresh water at many RV locations but it's best to use them with a quality drinking water hose. Ensure you get the right hose. While a garden hose is great for the average gardener, a water-safe hose ensures that no chemicals get into your water. It also ensures there's no gross plastic taste that makes it unpalatable. Keep in mind that a 3/4 inch hose can deliver around three times the amount of water than a half-inch hose for larger families. You might not need a heavy duty water hose, but a water hose is vital for the road. When you're planning your road trip vacation, don't forget these essential tools. Get the best heavy duty water hose options and RV marine hoses at Apex Hose today.